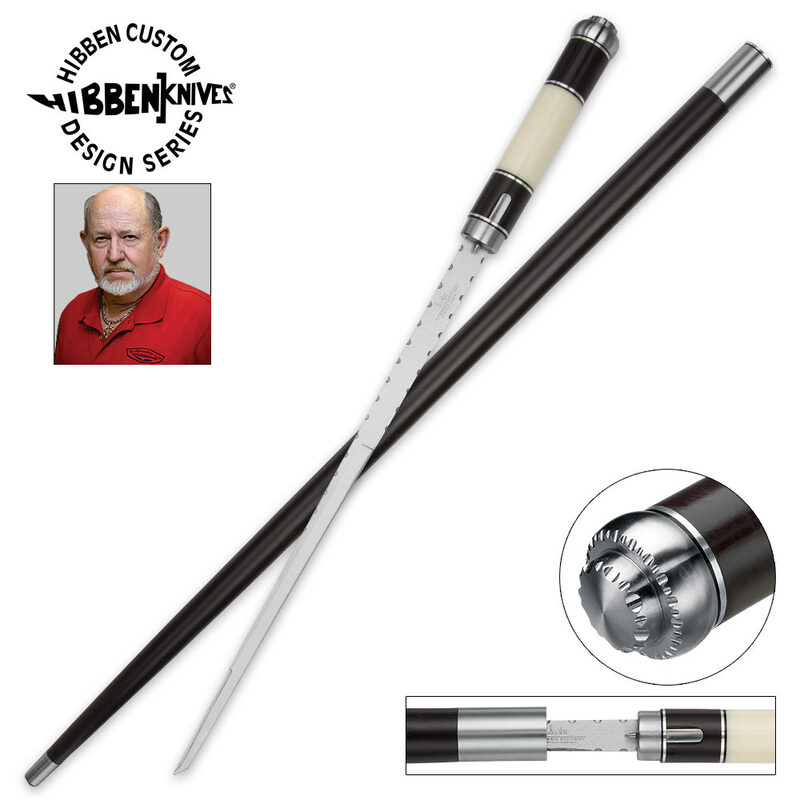 Designed for the security conscious man about town, our Self Defense Sword Cane by Hibben is the ultimate combination of elegant accessory meets defensive weapon. Self-defense features include the 7Cr17 stainless steel blade with mirror polish, tanto point, and a skull crushing stainless steel pommel atop the handle. Ready to draw your sword? 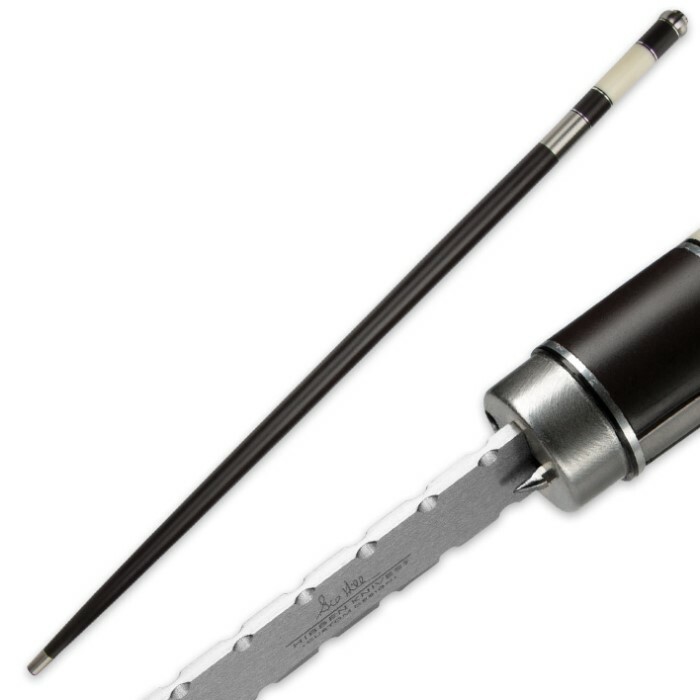 A quick press of the push button release while pulling the handle from the shaft is all it takes to reveal the blade hidden within this cane. Style features include a mirror polished blade, jibbed file work details along the blade and pommel, stainless steel fittings, faux ivory accent, and cherry stained finish. Measurements: 14 in. blade, 36 1/2 in. overall. Let me begin by saying that I have been looking for a solid, functional, self-defense, sword-cane at a reasonable price and I have admired this sword cane in the catalog for some time. I own several other Gil Hibben blades and I have never been disappointed in any of them. However, I was apprehensive about buying it based on the few negative reviews. I finally ordered one and overall, I'm pleased with the product I received relative to the price I paid. Overall, the sword-cane is a solid well-built product (relative to the price point) and it looks/feels good. As noted by others, the blade came out of the package with little or no edge on it. I believe this has more to do with making the product compliant with a broader range of marketplace restrictions (laws vary across the country) rather than poor workmanship. With a little effort, I was able to put a sword-angle edge on my new blade which is quite suitable for stopping an attacker. Some have noted that the blade is too short, but I find it just about right and well balanced. We should keep in mind, this type of "sword" is typically designed for self-defense and not designed to chop down trees with. The blade is thick and stiff enough for the designed length, suitable for slicing and stabbing. The two components fit solidly together with no wiggle or wobble. The cane is a bit heavier and robust compared to drugstore canes and well balanced to use as a club and I love the fennel made from solid stainless steel. The file-work or the fennel would some damage in and of itself. I quite pleased with the look and feel of the sword-cane combo and I'm glad I purchased it. You won't have to look very hard to find some minor workmanship flaws in the finish but I would like to point out, this product is not sold as a top-end, $thousand dollar, custom, hand-made, one-off collector's item -- it is a well made, functional, self-defense, sword-cane, that looks and feels good and priced to give you a very good value for the money you for it. To that end, I would recommend this product as a great EDG self-defense blade. All I got to say is its great an will buy more of Gil Hibben products an from CH KADELS Awesome!!!!! I like cane itself but not the sword in the cane. I love this cane as a cane but not as a means of self-defense. The sword aspect was not well designed overall. I think that the blade is too short to really do any real damage. And the blade is also very dull. However I do like how this cane functions as a cane. 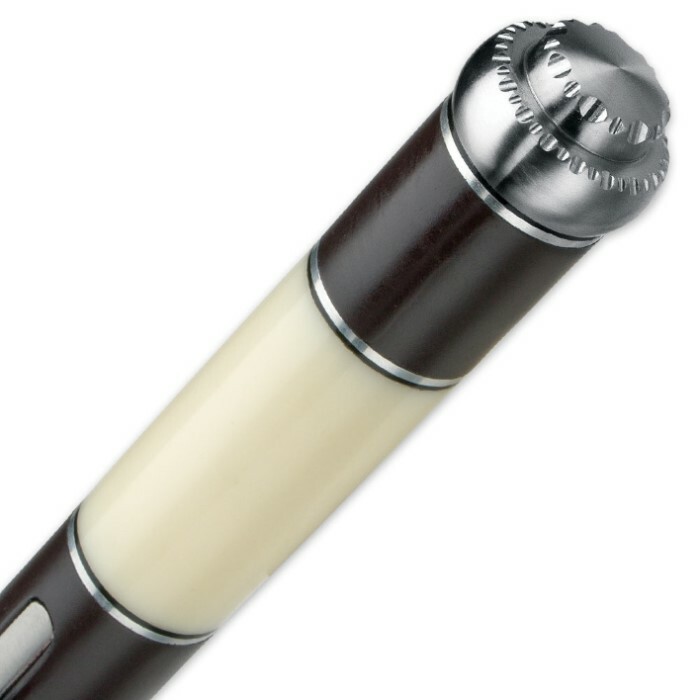 The cane design is great and I love the look and feel of this cane. But it is hard to deploy the blade. I think more time should have gone into designing the blade because the cane is amazing itself, it's too bad the blade doesn't match. Nice looking swordcane. Much better than the 19.00 version. A good buy for 5t5he price. A nice blade, if somewhat short. Well put together, but need to put something in the sheath for the rattle. Solid product with no rattle between the blade and the cane when sheathed, the picture is a little deceiving as the edge starts half way up the blade but it is still a solid blade. The only reason this is getting 4 stars instead of a full five is that the blade shifts in the handle a little but only when it is out of the cane. It feels like a product that had a lot of thought put into it. Beautiful cane, very well made. Blade is indeed mirror polished and looks lethal, but couldn't cut butter. Tanto point is reasonably sharp, though, so that's something.... These things can be corrected with lots o' sharpening. Only real complaint is it took WAY too long to get to SC from GA. Over 1 week from the time it went on the truck. All but 1 day bouncing around Columbia before it got to my door. No excuse. I was disappointed beyond belief! I thought Hibbon was quality stuff.not so because this is a pos.